I’ve been on a bit of a mint kick lately. 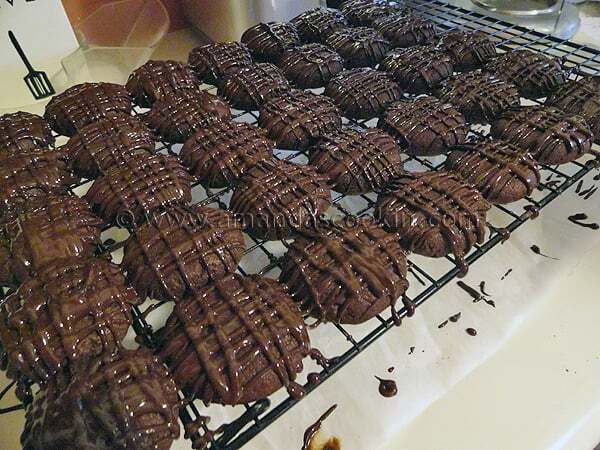 So when the opportunity arose to make chocolate mint cookies topped with pretty chocolate drizzles, who was I to argue? These cookies are small, they’re cute and quite yummy too. They are about the size of a half dollar, making them more of a button cookie, perfect for popping some chocolatey mint goodness into your mouth! When I came across these cookies, I was busy browsing around Renee’s site, Flamingo Musings, trying to find something for my Secret Recipe Club assignment for this month. While I ultimately decided to make the chocolate mint cookies, I had several others I was tossing around, such as these Hazelnut Shortbread Sticks or these Hazelnut-Butter Cookies with Mini Chocolate Chips. Both of these looked and sounded great, but to avoid the nut-haters, I stuck with the chocolate mint instead. Mine are a little different than Renee’s. The ingredients are the same, but I think the difference between ours is that my cocoa must have been lightly packed, causing my dough to be much more manageable that Renee described in her post. She stated that the dough was extremely sticky, requiring refrigeration before handling and baking. Her version is rolled into a log, chilled, then sliced. My dough was easier to handle and didn’t require that added step, so I skipped the log method as well. 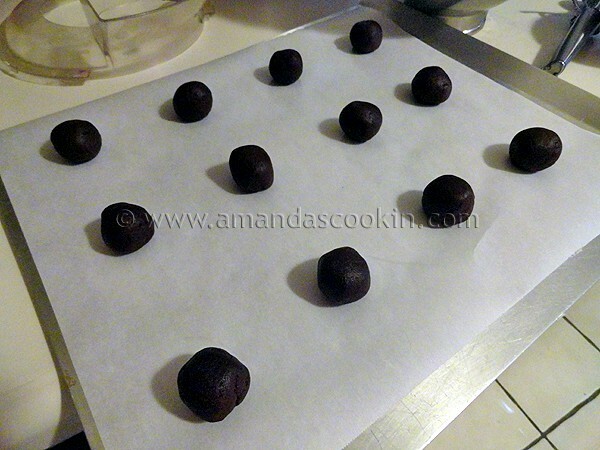 Instead, I opted for a cookie scoop, rolled them into smooth balls, then flattened them with a flat bottomed drinking glass. The result was a soft, cakey cookie with just the right amount of bittersweet drizzle. Lovely! Thanks for the great recipe Renee! Whisk flour, cocoa powder, and salt in medium bowl to blend. Using electric mixer, beat butter in large bowl until smooth. Beat in peppermint extract and vanilla extract. Beat in sugar gradually. Add egg and beat until blended. Add dry ingredients and beat just until blended. Preheat to 350°F. Line 2 baking sheets with parchment paper. Use a cookie scoop to get uniform balls of dough. Place rounds on prepared baking sheets, spacing 1 inch apart. They don’t expand much, so you can fit quite a few on one sheet. 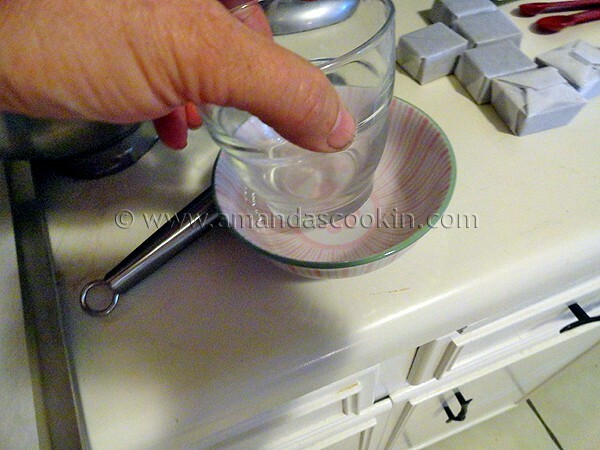 Roll balls to smooth then flatten with a flat bottomed drinking glass dipped in water. Bake cookies until tops and edges are dry to touch, about 13 minutes. Transfer baking sheets with cookies to racks; cool completely. Scoot cookies together so they are all lined up and touching. 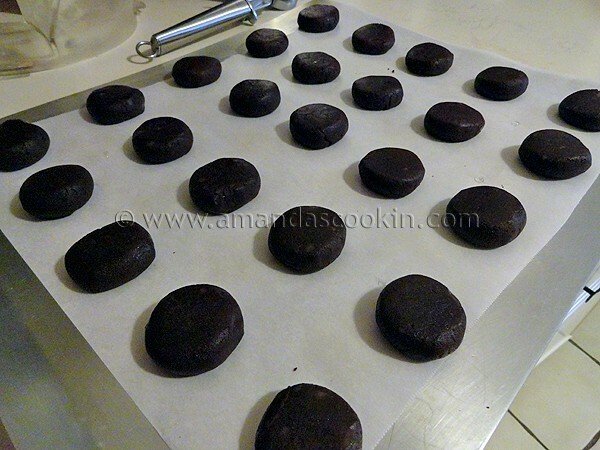 Place a piece of waxed paper under the cooling rack to catch chocolate drips. 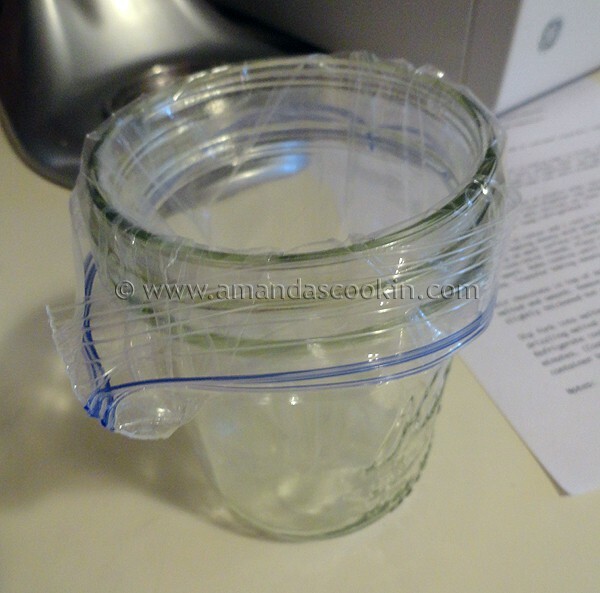 Line a jar or drinking glass with a zipper to sandwich bag. Melt chocolate in microwave and stir until smooth. 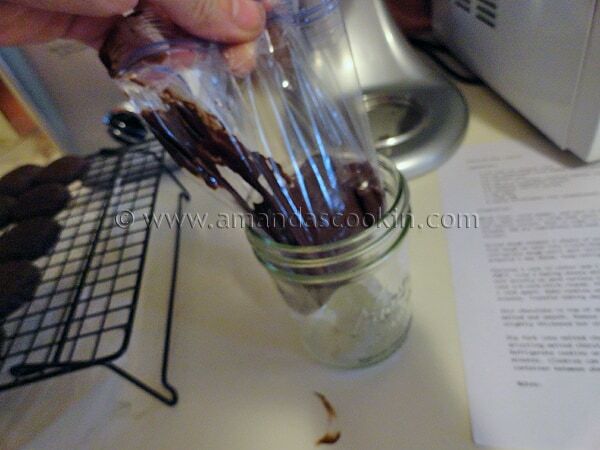 Add chocolate to bag then remove from jar. Squeeze out all the air and snip a corner of the bag off with scissors. 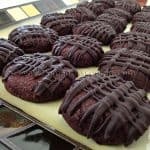 Use your piping bag to drizzle all the cookies back and forth in one direction, and then repeat in the other direction to get a criss-cross effect. Let chocolate harden. Place cookies in the refrigerator to speed this process. OH MY! My mouth is watering just looking at these! I am so making these after we move! I have a lot of mint, thanks. Thanks for all you do Amanda!! Sorry I’m so late getting around to commenting on all the delicious goodies this month! Mmmm… my brood would plow me over to get their hands on these! I love how the cookies bake up puffy. Thanks for highlighting this recipe. I have a feeling these would blow away any chocolate mint cookie, hands down, including GS thin mints. They look fantastic! Thanks for yet another great SRC month – really enjoying it! Oh those cookies look heavenly. I wish I could just pick one out right now and dig my teeth in. Amazing mouth watering pictures as well. Wow! Those cookies look like they would be hard to resist! I think they would be a great addition to my holiday baking! These look beautiful~so yummy and uniform! Those look so good! I will have to try next time we have game night. I love the cool flavor of mint, especially during the cooler months. Hmmm, the drizzling has given me some ideas for another project I’m working on. Gorgeous cookies (and love your tray). I’m putting these on my list of cookies to try for Christmas! ohhh, these are small, so I can eat more right????? I love mini cookies…but I lose count! :) These look and sound delicious Amanda! OMG…Crazy Good, I want some of these. My daughter would absolutely love these! Wow. Just wow. Can’t wait to try this out, Amanda. Great cookies Amanda, I’m having so much fun with SRC. Thank you for starting it up and putting in so much of your time and effort month after month! These look great! Mint and chocolate is one of my favorite flavor combinations…yum! Chocolate and mint together is a perfect combination. Your cookies look wonderful and I’m saving the recipe. BTW, LOVE the redesign of your blog – beautiful and easy to navigate. Brava! You and I both had chocolate and mint on our mind this month! Excellent choice and stupendous photos!! As always Amanda, your pictures look so yummy too! I can’t wait to try these. Thanks again. Oh man, these look so good! You know, I think humidity plays a big part in whether or not dough is sticky too. I wonder if it was humid in Renee’s part of the world that day. Your cookies look so beautifyl and mint is always my favorite. Great choice and I love the step by step tutorial. Love these cookies they look delicious! These sounds like an amazing cookie for the upcoming holiday season. I’ve stumbled and will keep these in mind over the next few months! Love the chocolate drizzles on top! Looking at these is making my mouth water!! I love chocolate and mint together, and these look wonderful!! The drizzle melting in the baggie, in the jar, in the micro….love that idea! And chocolate and mint? Heck there is no way this could have turned out bad! Gorgeous! And I’m sure they’re delicious, too! Amanda, these look phenomenal. I adore chocolate and mint together! Good morning and Happy Reveal Day! I really was super excited that I had your blog this week and I’m SO happy that I could make your day with that post. It was seriously fun to browse through here! I absolutely LOVE your new look here too by the way – the colors are so bright and fresh and fun! As for these cookies, I have to tell you, Aidan would probably go nutso over them. He is seriously into the chocolate/mint combination lately. He wants “grasshopper” everything so I’ll bet these would be a big hit! I’m bookmarking them for a lunch box treat soon. Thanks for all you do Amanda! Beautiful! I’m so glad Angela shared your cookies on Facebook. I really like the fact that you used a scoop instead of the log method. My logs always end up more as ovals after I cut them anyhow. I like the more rounded corners. My family will adore mint chocolate (I’m not a chocolate lover, so what I bake, they eat). Thanks for choosing this recipe and sharing it with us. Love how your version turned out, Amanda! Though I take great pains to mention that this was not *my* recipe, but Bon Appétit’s, and all the cookie doughs that year were sticky! 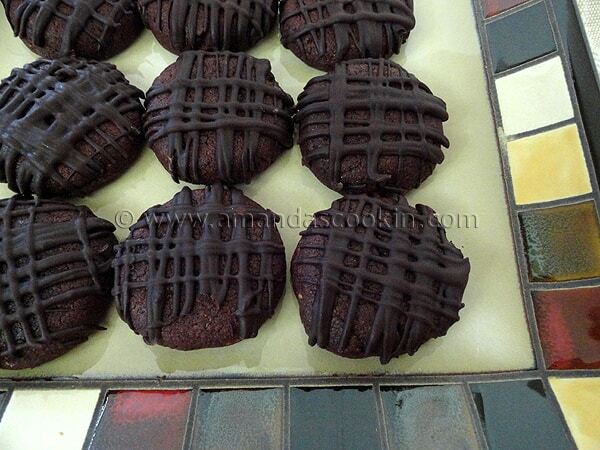 But you definitely proved that piping the chocolate drizzle is the right way to go – they look fabulous! mmmmmm love Chocolate and Mint together! great looking cookies! Yum, I also love mint anything! Thanks for hosting another awesome SRC!! Mmm, mint! They look great! You ARE on a mint kick. Now I need to try these cookies WITH your ice cream! 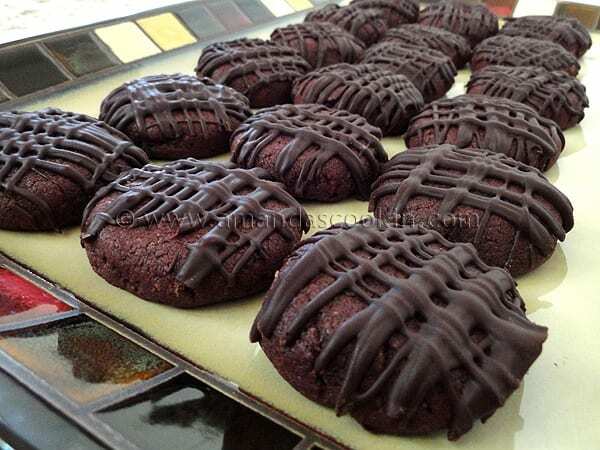 Oh I love mint & chocolate and your cookies look to die for! YUM! The cookies remind me of a girl scout cookie, flavor wise. They sound delicious. I’m missing the SRC so much :( I hope I can get back into it soon. Things are just dwindling down before I move back now. I love how you drizzled them with chocolate. They look so yummy! MMM! In my opinion, you can’t beat the combo of mint and chocolate. My kids would go crazy over this recipe. 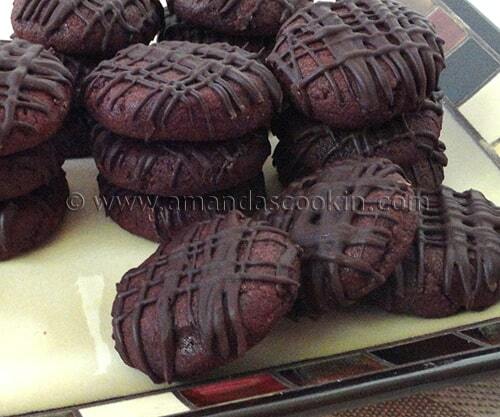 Great looks cookies Amanda…I adore chocolate with mint. Ps congrats on your migration to wordpress- can’t believe you did it by yourself- I am so impressed! Wow, Amanda, those are beautiful! Great job! Chocolate/mint is one of my favorite pairings. What a great way to start the week. My kitchen is going to smell incredible. Thanks.